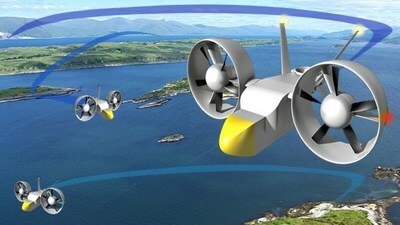 A group of entrepreneurial UK engineers has plans to build a mid-mass logistics drone for global markets. The system will be aimed initially at remote and isolated communities, but is planned to be fully capable of near urban operations in due course. The UAV system, called Sky HopperÂ®, is an electrically powered tri fan design to be constructed at Prestwick in the West of Scotland. Its avionics are being developed in Hampshire in South Central England. Â Cargo mass load is 100 kilograms. The Sky HopperÂ® team brings together aeronautical engineers, certification and design specialists, electric machine designers, and advanced battery developers. Its promotors stress that the project will follow a carefully managed step-by-step approach. "Civil UAV development is still in early days," says project leader Eben Wilson. "We want to engineer a pathway to a commercial future; and we have the strong team to work through the certification requirements alongside the technical issues. It's a challenge, but it really is time we did this." "Taking a step upwards to an industrial vehicle demands that we innovate across all our disciplines," says Dr Richard Brown, the project's aerodynamicist. "We plan to build a series of demonstrators, resolving structural, power and flight control needs. We have some of the best skills available, and we are a small agile team." Pushing the envelope of unmanned aerial capabilities demands close co-ordination with the regulators to devise safe operating methods and procedures. "The regulators want a civil UAV industry to develop in the UK," says Fred Gorrie, technical lead in design certification and regulation, "but they also want safety equal to normal aerospace industry competences. That's where we want to go too, and we think Scotland gives us the space to do that." 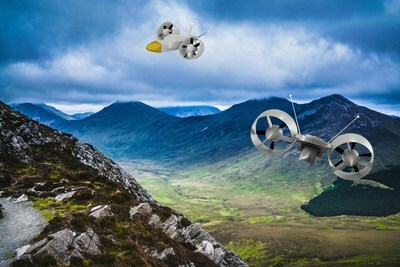 With its thinly inhabited landscape and coast, the West of Scotland offers a unique territory to develop beyond visual line of sight (BVLOS) potential, while testing autonomous flight capabilities. "The commercial potential for UAV operations is huge globally. We're talking re-supply, infrastructure support and other as yet unanticipated logistical operations," says project lead Eben Wilson who is an economist by training as well as being a forward-looking industrialist. Â "We've got to grasp the future and believe in our engineering expertise." The Sky Hopper project commercial plan includes unmanned delivery networks that set up local communities as franchisees for aero-parks; locally owned assets through which multiple Sky Hopper missions are flown, creating revenue for local communities. The end-to-end innovation for the project extends to its funding methods. So far, early prototyping has been privately funded; the founders have invested their own money along with some initial sponsorship funding. A sequenced campaign of further donations, crowd funding via Indiegogo and a follow up Enterprise Investment Scheme is underway. "We may sound like evangelists, saying that we want the funding to be based on a shared interest in inspired innovation, but we really mean it," says Eben Wilson, "in today's global markets we can stand on the side lines and wait for the big corporates to come along and feed us with their trinkets; allowing us only to become their shopkeepers. But that's not what we British have been in the past, and certainly in the West of Scotland we feel firmly entrenched in our historic industrial traditions. We like building stuff, and Sky Hopper contains the stuff of the future."